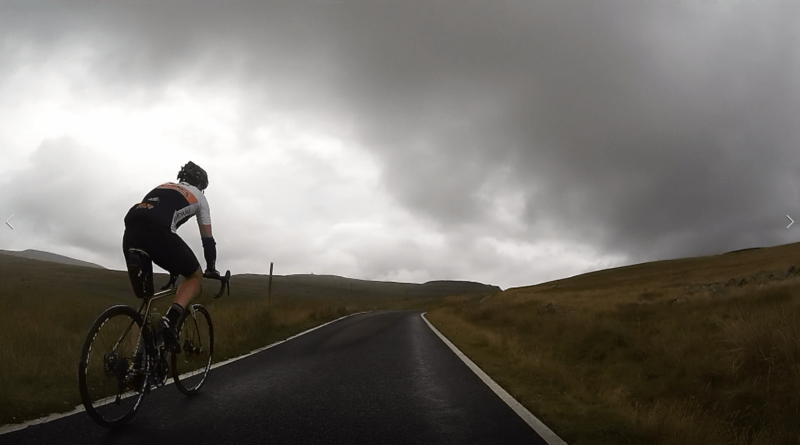 For a hill loving, road cyclist these are the ultimate aims. To ride the highest road, to climb the longest climb, to achieve your maximum elevation gain, to test yourself on the steepest of gradients. It’s the love of pushing yourself, of achieving the next level of difficulty that drives us on. Well the road that winds it’s way up to the top of Great Dun Fell offers all of this and gives us an excellent surface, almost entirely free of cars on top. And so this hill, or mountain if you prefer, became the focus of day 2 of my recent trip up north with Phil and Andy. We had tested ourselves in the smaller hills of the Yorkshire Dales the day before and then come up to Dufton to stay overnight close by Great Dun Fell in the village Youth Hostel. 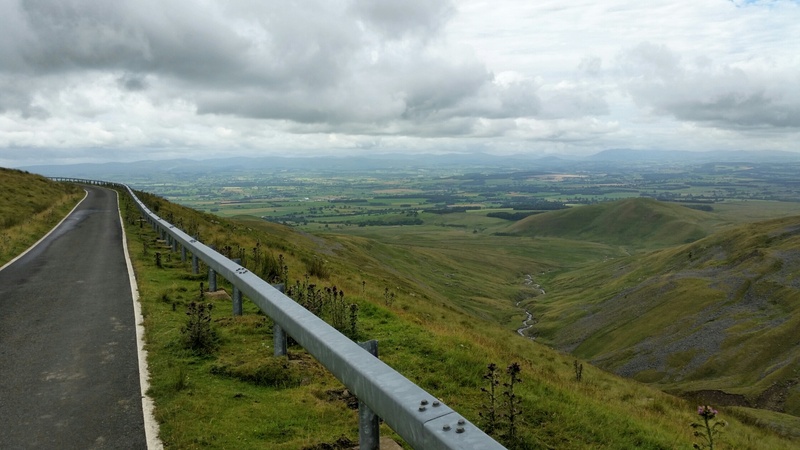 The focus was the climb, there would be no cafe stop, it would not be a long 50 mile + route and shock/horror it wouldn’t even be incorporated into a loop! We would just warm up around the roads in the valley, go straight up the hill and then come back down the same way. 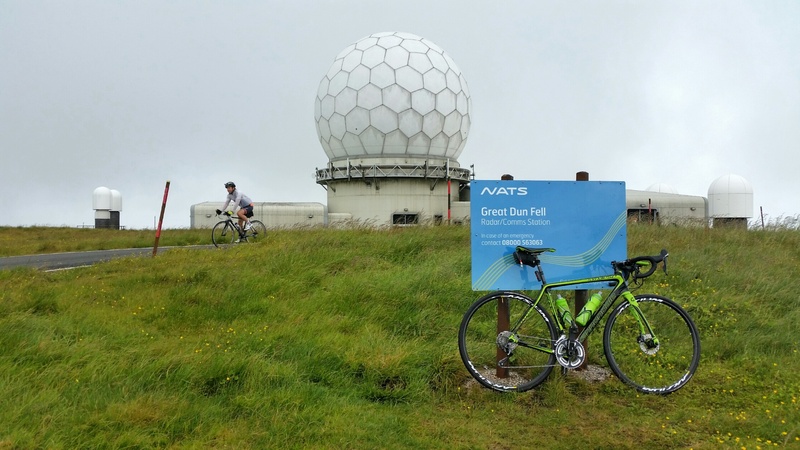 Part of the reason for the unusual lack of looping (cyclists love loops after all) is because the hill up to the top of Great Dun Fell is primarily a service road for the radar station that’s perched up there, all alone apart from a few sheep. The radar station is also the reason that the road goes to the top. It’s unusual for roads to go to the tops of hills, most roads are built in the valleys and those that do go up and over do so at the lowest point for ease of construction. And so this is a no through road, once you reach the top the road stops, given a mountain bike you could continue but not on a road bike. So once we’d tucked in to our big breakfast, some bigger than others, we set off with varying degrees of excitement and trepidation. How tough would this climb be? Would we make it to the top? What would the conditions be like up there in amongst that low cloud? None of us had any experience of this climb and certainly I hadn’t climbed anything this big before. On Strava you can see your biggest ascent on your profile and mine currently stood at 414 m of elevation, at the end of the day this would hopefully read 758 m. Not quite double but not far off. 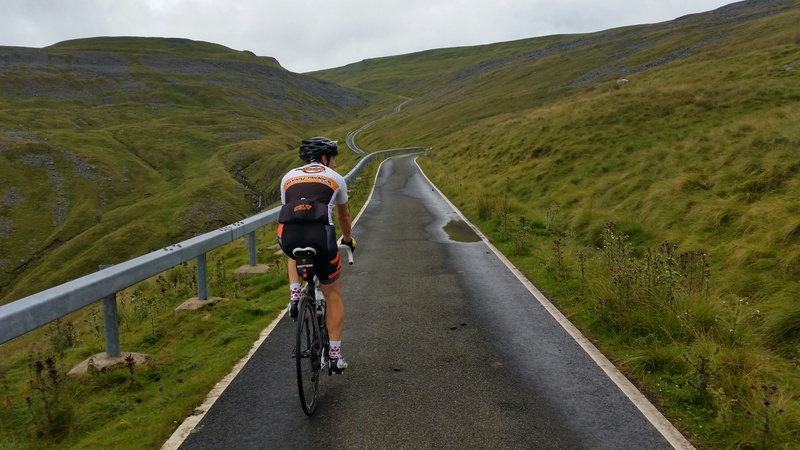 Our short warm up consisted of riding out of Dufton away from Great Dun Fell in the direction of Appleby-in-Westmoorland and then back around through Long Marton and Knock before turning right onto the climb itself. 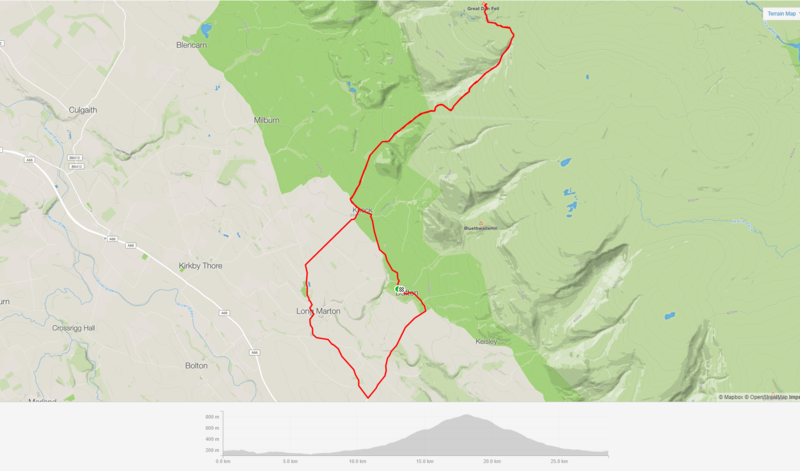 One of my reasons for taking this route into the climb is that Long Marton is the lowest lying point from which you can begin the climb, so you actually add a few extra metres to the total climb by riding from there. To begin with the climb is nothing special. You start off turning up a road that’s much like any other you might ride and the wooded areas around you keep you from seeing too much of the surroundings but it’s not long before you pass a farm on the left and start to see some of the fantastic views. Once you reach around 300 m of elevation you’ll get an awesome view to your right around the back of Knock Pike. 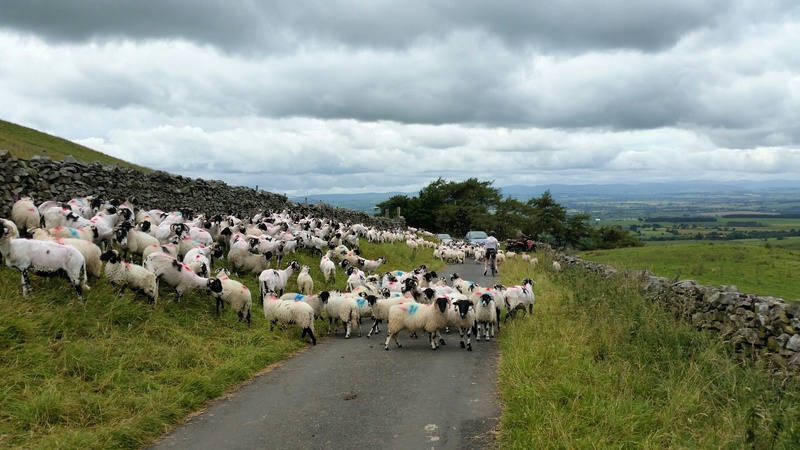 This is also where it officially changes from a public road to a bridleway, so apart from authorised vehicles you should now only meet walkers, cyclists and horses; oh and plenty of sheep. This is also the point where the climb started to bear it’s teeth and I pushed on up while the other two stopped to take photos. Keeping the pace low but the legs turning all the same. This allowed Phil to catch up and join me for the rest of the climb while Andy did his own thing at his own pace. As you’d expect the road follows the path of least resistance and so although there are plenty of steep ramps, at times it eases to much lower gradients which allow for brief periods of recovery; on occasion even heading downhill a little. It was as Phil and I pushed on to around 600 m elevation that I turned my screen on and started to keep an eye on the elevation reading. Knock Ore Gill flows down to your left at this point and you can clearly see the road steepening ominously up ahead. I find it useful in these situations to know how much further (and higher) remains. It may be a steep section and one that made the legs burn but we enjoyed the shelter provided by the small valley, unfortunately it was short lived because as we reached the open fell land above we were hit by a biting, blustery wind that seemed intent on making things difficult for us. Now in sight of the radar station but still needing a good effort to actually get there. It had been a tough climb but we’d ridden it conservatively in a good measured fashion and so with around 20 m of elevation left I found the legs for a final hard effort, just to finish with a flourish. 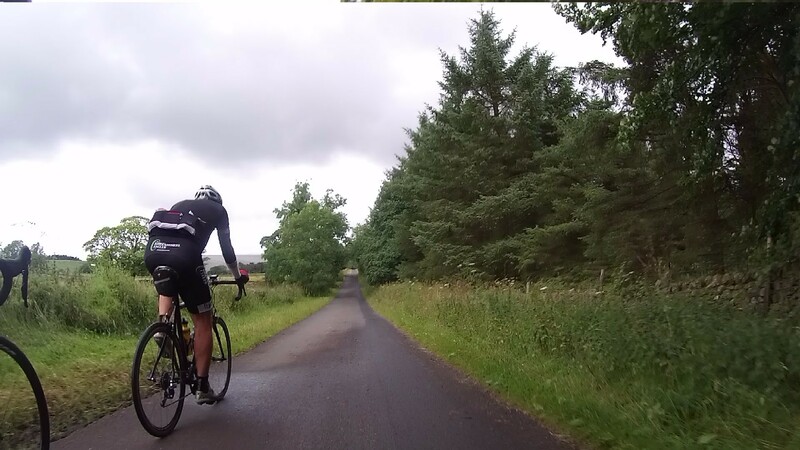 It wasn’t a nice summery July day but with the temperatures in the mid-teens as we left Dufton we had at least dressed in shorts and short sleeved jerseys but we’d brought our lightweight jackets too. These now became essential kit as the temperature on top was well down in single figures and with the wind all the more chilling. On a clear day the view must be awesome from the top, unfortunately for us it was definitely not a clear day! Once we got back down below the clouds we did get the a good view of the awesomeness though. Heading down is a ride in itself. Most descents that I’ve ridden are over in a short while, this one however just keeps going and going. You really get a feel for just how big it is and how far you climbed. Looking back on Strava afterwards, it took 47 mins to complete the climb, we did stop at times and didn’t go full gas but even the fastest climb time is 25 mins. That’s a lot of time on a single climb. Back down in Dufton after several stops for photos and a short stop to navigate our way around a shepherd and his flock we met up with Andy, who had decided not to ride all the way to the top but had still managed a respectable amount of climbing all the same. So we congratulated ourselves over a spot of lunch at The Stag; the posh fish finger sandwiches went down a storm. I will definitely be coming back when I get the chance and not just for the pub lunch! This is a climb that I want to ride again, once is just not enough. I can also thoroughly recommend it to anyone who likes their hills. It may be a remote location and you’ll almost certainly need to plan a trip specifically around Great Dun Fell but it’s worth it.